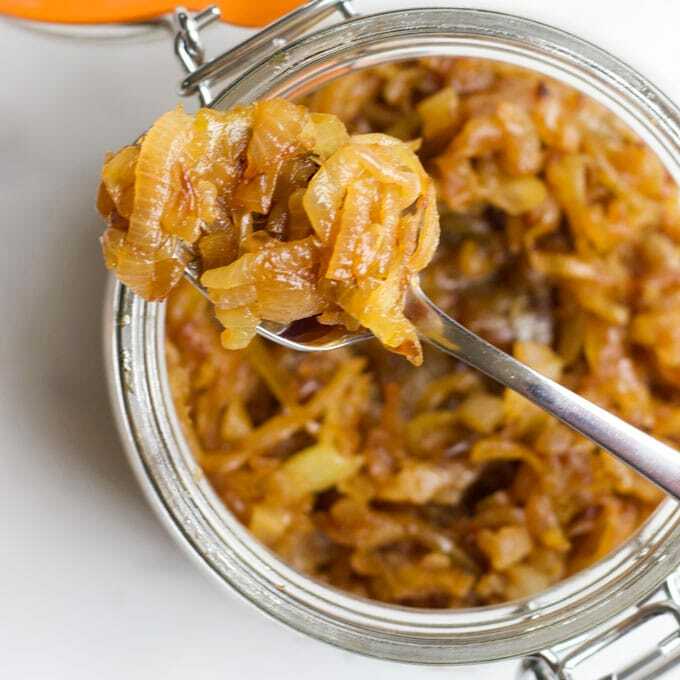 Soft, sweet Caramelised Onions, a perfect accompaniment to a variety of dishes and snacks. 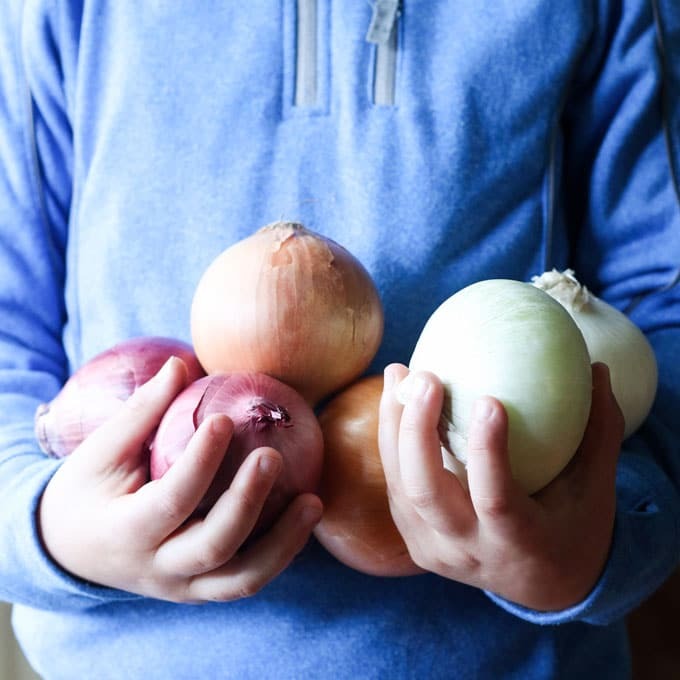 Do you have a child who hates onions and can spot even the tiniest onion in their meal? My youngest used to be exactly like this. That was until he tried Caramelised Onions. My little onion hater literally eats these onions straight from the jar. I love when you find a way for your child to like a food they previously hated. Even though they may still not like it cooked other ways, it helps them become more accepting of that food. Why are Caramelised Onions Sweet? The sticky sweetness of caramelised onions is what makes them so irresistible and I know it is why my onion hater loves them. Onions are actually naturally sweet and when you gently cook them, over a long period of time, the natural sugars in the onions are released and caramelise. This makes them deliciously sweet and flavourful. Through patient cooking, a good level of sweetness is achieved and there is no need to add any sugar. Any onion will caramelise. I usually use brown or red onions or a mixture of both. You can slice your onions as thin as you’d like, but I recommend keeping them between 3-5mm thick. They will shrink up considerably while cooking. I like to use a mixture of butter and olive oil but if you want to make the recipe dairy free you can omit the butter and replace with more oil. You want enough fat to cover the bottom of your pan and nicely coat the onions. I recommend using a stainless steel or cast iron pan. You can use a non-stick pan but you won’t get the same intense flavour. Using a stainless steel/cast iron pan for cooking will result in caramelized bits building up on the bottom of the pan. This creates a rich flavour that you won’t get with a non-stick pan. I used a large 30cm (12 inch) pan, if you don’t have as big a pan you will want to reduce the number of onions you use. 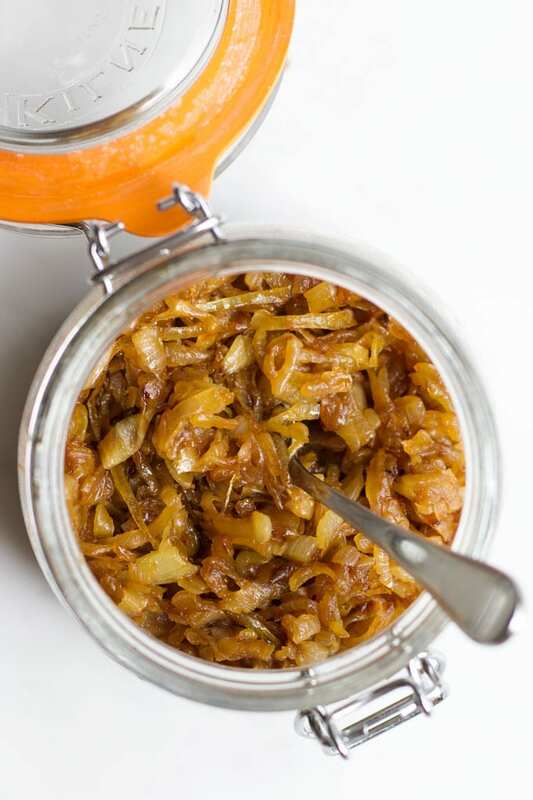 Low and slow is definitely best when it comes to making caramelised onions. I generally use a medium-low heat but this may vary depending on your stove. Adjust the heat as necessary to cook at a slow and steady pace without burning. 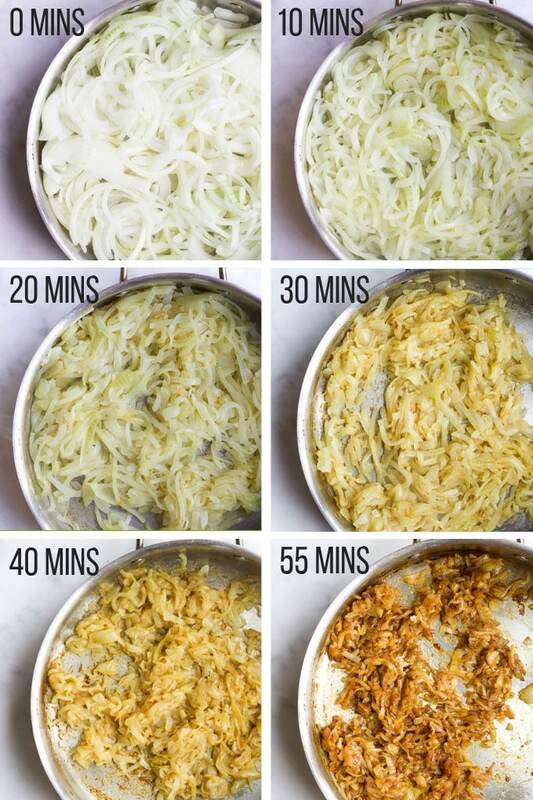 I recommend you stir these onions every 3-5 mins. Less at the start of the cooking time and more towards the end. You want to leave them untouched for long enough that they form that caramelised brown bits on the bottom of the pan (that you stir into the onions) but not long enough that they burn. The caramelized browning at the bottom of the pan provides a lot of flavours and you want to incorporate that into the onions. At the start of the cooking, you can just scrape this back in but at the end of the cooking, you will need to deglaze the pan. I use a little stock to do this. You just need a tiny splash. It takes around an hour to make really good caramelised onions. Don’t try to rush it by turning the heat up, the onions will burn. I don’t recommend adding sugar to speed it up either, it will lack that deep caramelized flavour that only time will give. I usually make caramelised onions when I am in the kitchen cooking a meal or preparing lunchboxes etc. Although they take a good hour to achieve that sweet and sticky deliciousness, they aren’t hugely labour intensive. You just need to be available to stir every five mins or so. Life can be very busy, especially with kids, so if an hour in the kitchen is too big an investment in your time then you can always make them in the slow cooker. The great thing about the slow cooker is that you pop the sliced onions and oil into the cooker and leave it. It does take a long time (10 + hours) but you do not have to do anything or think about it. 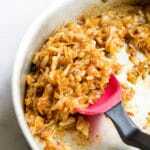 Fill your slow cooker half to three-quarters full of sliced onions and add around a tsp of oil for every onion you add. Stir to coat and cook on low for 10 hours. You will find that there is liquid at the end of the cooking time so I cooked for a further 3 hours on low with the lid ajar. The result isn’t as good as cooking slowly in a pan but we were more than happy to eat the end result. However, I don’t think I would make them again in the slow cooker. This is mainly because I am in the kitchen a lot and popping them on the stove works best for me. Refrigerated in a sealed container for three days. Alternatively, you can freeze for up to 3 months. Pop them in a zip lock bag, flatten and freeze. You can break pieces off so that you don’t need to defrost it all. Heat butter and olive oil in a large pan, over a medium heat, until melted. Add onions, and toss until they are coated in the butter oil mixture. Once the onions are soft, sticky and deep brown in colour deglaze the pan with the vegetable stock adding just enough to loosen the sticky brown bits on the bottom of the pan. Stir it into the onions for extra flavour and continue to stir for a further minute. Serve immediately or allow to cool to room temperature before refrigerating. To make this dairy free you can replace the butter with more olive oil. If you use a non-stick pan you may not require the stock. The stock is for deglazing the pan at the end of cooking, non-stick pans generally do not need this. Less stirring is needed at the start of cooking and more towards the end. My kids love caramelised onions too! Any tips on getting them to love raw onion?